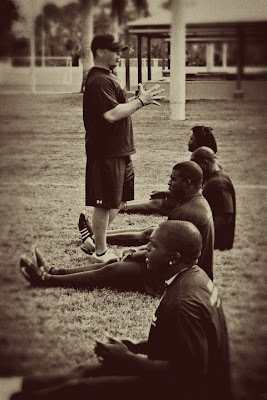 NAPLES, January 19, 2012 — Ignition® Athletic Performance Group announced today that its NFL® combine training program in Naples, FL is officially underway. The nationally recognized combine prep program has produced 21 players on active NFL Rosters over the last two years including Florida Teams Miami Dolphins®, Tampa Bay Buccaneers® and Jacksonville Jaguars®. Athletes from the Nation’s top collegiate football programs have enlisted in Ignition Combine Training to prepare for the most important job interview of their lives: the NFL Combine. The 10-week program is designed to improve the athlete’s speed, strength and skills specific to the testing at the scouting combine. Now in its seventh year of combine prep, Ignition APG operates out of two locations and serves as an ongoing training partner to more than 130 athletes who have played in the NFL. Ignition APG Performance Director Clif Marshall heads up NFL Combine training in Naples, Fl. As in previous years, the Ignition Florida recruits will be utilizing North Collier Regional Park, Barron Collier High School and Real Fitness – A CrossFit Gym for portions of their training. Ignition’s chosen hotel, Staybridge Suites – Naples, along with Jason's Deli, Matthews and Gardner Catering, Spa 41, Dr. Kevin Myrmo Chiropractic, Performance Physical Therapy and Bala Vin Yasa Yoga Studio are local sponsors to our program. Ignition Athletic Performance Group is an elite training partner offering programs and services for professional, amateur, collegiate and scholastic athletes. Headquartered in Cincinnati, Ohio with satellite locations including Naples, Florida, Ignition has produced 15 NFL® Draft Picks, including Devin McCourty: 1st round in the 2010 NFL Draft and 2010 NFL Pro Bowl Recipient. Ignition also produced the Fastest Offensive Player at the 2011 NFL Scouting Combine, Edmond Gates, Miami Dolphins. More information can be found at www.ignitionapg.com and www.ignitionapg.com/combine.